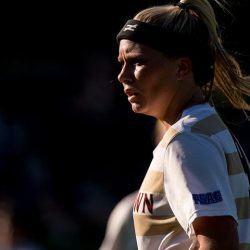 KUTZTOWN, Pa. – Kutztown University sophomore women’s soccer player Maddie Mohr has been voted an NCAA Division II First Team All-America selection by the United Soccer Coaches. It is the first time in program history that a Golden Bears player has earned First Team All-America honors. It is the second straight year that Mohr has been named All-America, having garnered Division II Conference Commissioners Association Third Team honors in 2016 as a freshman. Earlier in the day, Mohr was tabbed to the United Soccer Coaches All-Atlantic Region First Team, joining teammates Morgan Staley and Emily Zwiercan, along with Alyssa Ryan, who was voted to the Third Team. Mohr is now a two-time All-America selection, a two-time All-Atlantic Region First Team member, a two-time All-Pennsylvania State Athletic Conference (PSAC) First Team honoree, and was named the KU Female Freshman of the Year last year. The Elizabethtown, Pa. native finished the year tied for the team-lead with 14 goals (third in PSAC) and 28 points (fifth) and ranks seventh in program history with 25 career goals. She has started 44 of 45 games throughout her career. Mohr is the only member of the PSAC to be named to the First Team. East Stroudsburg University goalie Jules Harris garnered Second Team honors, along with West Chester University defender Julia Kirkpatrick. Mohr will be formally acknowledged for her accomplishment at the United Soccer Coaches All-America luncheon on Saturday, Jan. 20, at the Pennsylvania Convention Center in conjunction with the 2018 United Soccer Coaches Convention in downtown Philadelphia, Pa.